The Bully Beat is the place to read the latest news about our bully buddies. It is the intention of the Bully Beat to function as an online community – where we can come together to brainstorm ideas for bullies and their challenges. The difficulties we encounter as lovers and advocates for the breed will also be addressed. 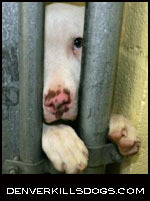 One topic that will be a constant until there is no longer a need is Breed Specific Legislation, (BSL). It is the intention of The Bully Beat to work toward ending this present day Holocaust. It is a fact that dogs, even mothers along with their puppies are killed simply because they are born and considered to be specific breeds. It is a fact that family pets have been confiscated from their homes and murdered. It is with great hope that we can help educate those who are unaware while we attempt to redirect the many that simply turn their heads and look away from the cruelty happening each day. It is the goal of the Bully Beat to open the eyes of all, to expose the horrors of BSL along with the danger and repercussions of its actions. We must work together to continue to get our message out to the public and to the mainstream media. The many challenges that these dogs face must be addressed now, before, there are none left to fight for. We may be relatively few in numbers but our strength, sincerity and perseverance will help change the world for these dogs, I have every confidence that we will see this happen. Education along with getting those bully ambassadors out before the public does help, and things are slowly progressing, but this is not enough; our challenging work must continue, as long as animals are being slaughtered due to ignorance.